"Evil seeks evil." Lionsgate has launched an official trailer for the latest Hellraiser film titled Hellraiser: Judgment, which is actually the 10th film in the Hellraiser series (believe it or not?). I didn't even realize there with this many. The original horror cult classic Hellraiser was released in 1987, from writer/director Clive Barker. 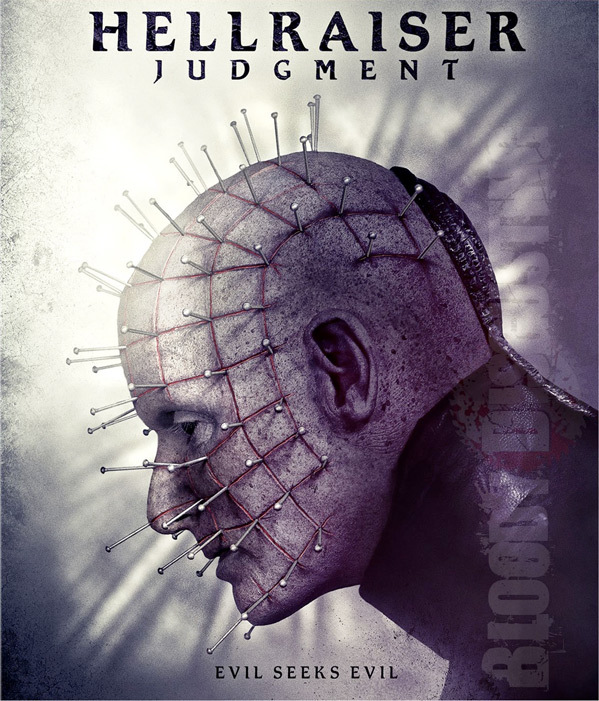 Hellraiser: Judgment is directed by Gary J. Tunnicliffe, who has been working for two decades as a horror make-up effects artist before jumping into the director's seat this time. It tells the story of three detectives as they struggle to solve a horrifying murder, but instead find themselves thrust into the depths of Pinhead’s hellacious landscape. Starring Paul T. Taylor as Pinhead, along with Damon Carney, Randy Wayne, Alexandra Harris, John Gulager, Mike Jay Regan, plus Heather Langenkamp. See below. Detectives Sean and David Carter are on the case, to hunt down a gruesome serial killer terrorising the city. Joining forces with Detective Christine Egerton, they dig deeper into a spiralling maze of horror that may not be of this world. Could the judgement awaiting the killer's victims also be waiting for Sean? Hellraiser: Judgment is both written and directed by English filmmaker Gary J. Tunnicliffe, of the films Hansel & Gretel and Jack and the Beanstalk previously. He first got started in the film industry working on make-up/special effects crews in the 90s, including Hellraiser III: Hell on Earth and Hellraiser: Bloodline. Hellraiser: Judgment will be released direct-to-VOD/DVD starting on February 13th this winter. Anyone?